Vhöl is turning out to be--as their debut might suggest--more than just a supergroup. It's a worthy, unique band in its own right. As I described them before, they're sort of an American Darkthrone, combining black metal with old-school heavy metal, crust, and thrash. The formula from the first album is intact, but this time around the song lengths are more varied. The title track here is a mesmerizing 12 minute piece, but most of the other tracks tend toward more conservative lengths. But more importantly, the thing that sets Deeper Than the Sky apart from its predecessor is pure riffage. The riffs here are simply unimpeachable, incredibly memorable, and they will make you bang your head. Again, I must mention Mike Scheidt's vocals. I'm not a long-time YOB fan--I've come to appreciate them more--but here is where his high-pitched, old-school metal voice really shines. This was his calling all along. This one is definitely worth your time and money. - On bench press, I did 200 for 6 reps, and 190 for 11. 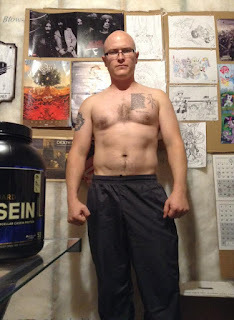 - On overhead press, I increased my max from 150 to 160. - On deadlift, I increased my max from 375 with straps to 390 without. I had always been training it with straps before, but Wendler's right--you shouldn't do that. I've focused a lot on grip strength as well. - I've learned more about programming accessory lifts. I attempted a new bench press max, but I was using my bench with the leg extension/curl attachment, which sits higher off the ground. I was trying to dig my feet into it, and all I did was cause pain in my hamstrings trying to brace myself. I'm going to start using my other bench for bench press and get myself in a proper position next time around. My squat is on a different rep and progression schedule for now, to make up for a lifetime of not squatting deep enough. I'm going at it twice every week, with a 5 pound increase each time. It's at 155 right now, and the plan is to get it to 250 on January 18. After that, I'll go back to once a week on squat, but continue increasing it by 5 pounds every week until I stall out, at which point I'll put it on the 5/3/1 schedule as well. Unfortunately, my attempts to build mass have had little impact. About three months ago I weighed 170. Ever since my lifting during my junior year of college, I have weighed somewhere between 160 and 170. I managed to build myself up to 180 as of a month ago, but despite eating like a ravenous beast I may have lost a pound or two in the month since. For a month I've been adding Slim-Fast shakes in the afternoon, which worked for me in college. Over the past week I've taken to downing shakes of peanut butter, milk, chocolate, banana, and oatmeal, but that hasn't done the trick yet. Today I added a hardboiled egg to the blender, and I'm looking for other ways (short of adding olive oil to the shake) to pack in more calories. I'll keep you posted on that.